So cute! If they were chocolate I wouldn't be able to resist. I would buy one too! 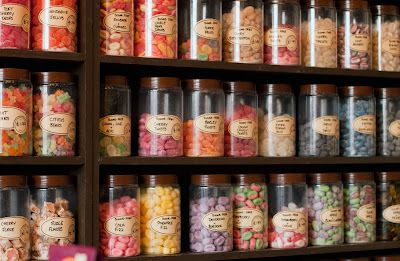 I like the names as well as the sweets - some pear drops for me please. Fantastic. I love sweets in jars. Where is this? I want some! Oh, i love how old fashioned and authentic this looks! Just like I remember sweet shops looking when I was a young lass. It normally takes me ages to make up my mind!